Last time, we looked at The Department for Transport Guidance notes - they told us the first order of business, when providing for cyclists, was to look for ways to reduce traffic volume. Our hands are probably a bit tied here - there aren't many roads in and out of Wivenhoe, and the proposed Wivenhoe/University cycle path follows pretty much the only route if you want to go North or West; anywhere that isn't the sea really. But just because we can’t do much, doesn’t mean we can’t do something. Before and after. Reducing max speeds on Alresford Rd. 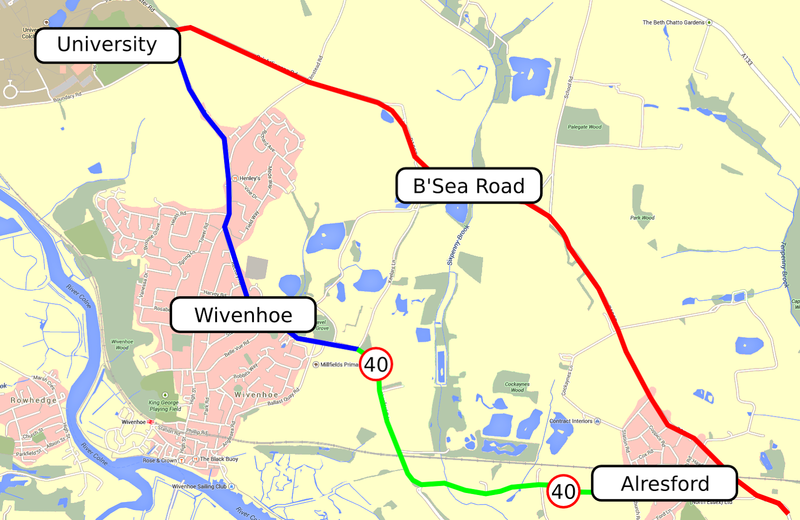 If you want to travel from North and West of Wivenhoe to Alresford, Brightlingsea or beyond, there are two likely routes: Brightlingsea Rd (in red on the map below) for through traffic or Alresford Road (coloured green) for local traffic. By introducing a new 40mph speed limit on the Alresford Road route, our small idea increases it's value as a local route making it less hostile for walking and cycling, and devalues it as a route for through traffic - encouraging through traffic to use the faster Brightlingsea Road, bypassing the Wivenhoe to University route. The first corner on the Alresford road also happens to be notorious accident spot, there was another crash the day after I wrote the last post. Reducing speeds should also help improve safety here. Next post we'll look at reducing traffic speeds on the new cycle path route using some techniques pioneered at the UK's Transport Research Laboratory.